Ben and Jerry’s Greek Frozen Yogurt | DidjaEat? Every so often, something that’s been around forever becomes hot. The past year or so, Greek Yogurt (made form real Greeks!) has been super hot. Every major dairy producer has tried to get in on the act and I’ve seen it all: Greek Yogurt with fruit, with spices and even with chocolate (gross). The thing is, it’s a tart kind of taste and either you like it or you don’t. Masking it with flavors won’t stop that. I like the plain kind with the zero fat. It seems to taste better to me, more of a coherent flavor. But that’s just me. 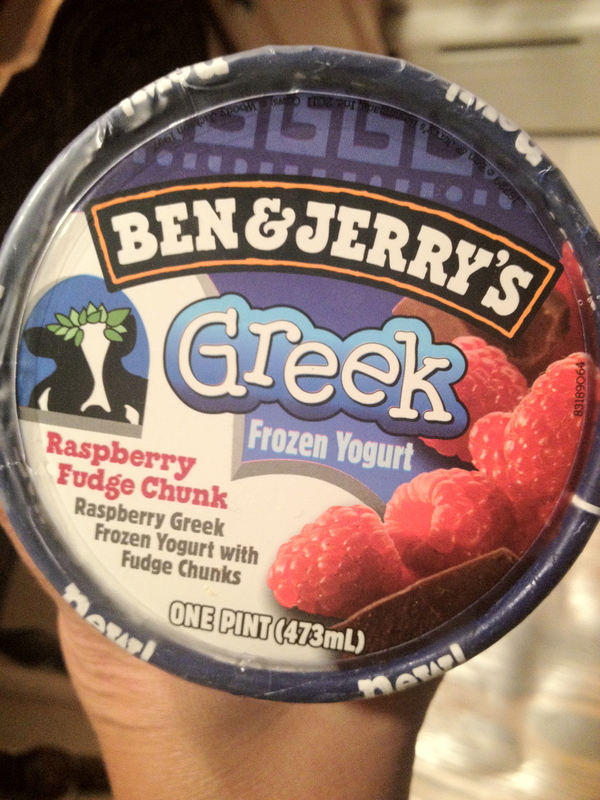 Anyway, since everyone is jumping on the Greek Yogurt fad, leave it to the brainiacs at the Ben and Jerry’s division of Unilever to come up with a Frozen Greek Yogurt! I saw it in the store a little while ago and was intrigued. Would it be that sharp, tart taste of the yogurt in frozen form? The answer is yes, but also no. Let’s start with the Raspberry flavor. It’s pretty subtle, almost hiding in the wings, waiting to jump out but always chickens out. It’s like half there, but still there. I thought, as I was eating, that I wouldn’t like that after while but it mingles nicely with the other flavor: the fudge chunks. The fudge, which is the same as the fudge in the Phish Food ice cream and the same shape as the chocolate in Cherry Garcia, is plentiful. When I say plentiful, I mean they jam a lot of those chocolate chunks in there. I’m not complaining, don’t get me wrong, I’m just reporting: lot’s of fudge chunks. Or, actually, more like fudge slats, about the size of After 8 mints (remember those?). The actual Frozen Yogurt itself is interesting. It has a tiny bit of that tart zing, but not a whole lot of it. It tastes better then the usual flatness of frozen yogurt, but without the punch you in the tastebuds of the Greek Yogurt. It’s a genuinely interesting flavor and pretty unique. I imagine some other ice cream companies will have this out sometime soon as well but for now, B&J’s has the corner on it. I normally don’t buy ice cream and/or frozen yogurt, and if I do, I normally don’t buy Ben and Jerry’s because it is a little pricey and I am persistently broke. But for this, I’d scrape up some change. The blueberry crumble one looks interesting as well. I better go hit the treadmill before I hit the grocery store! 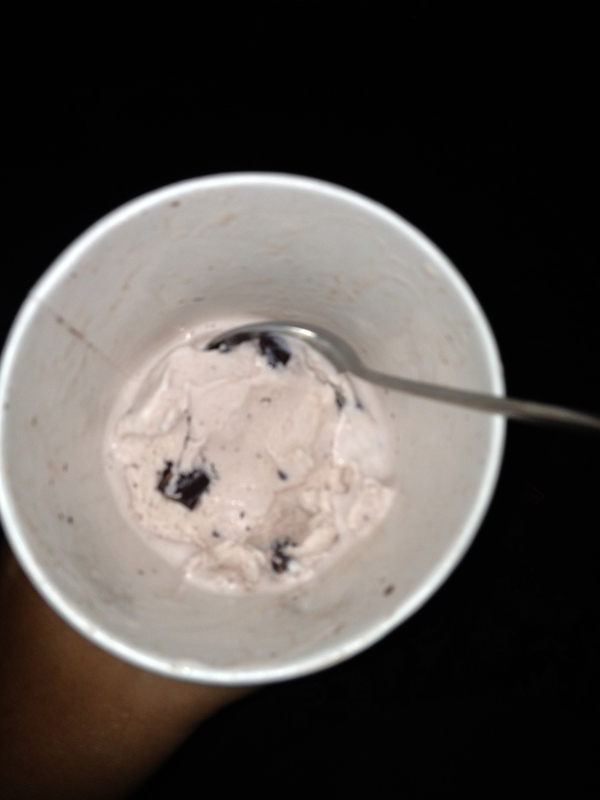 Posted on August 15, 2012, in ice cream and tagged Ben and Jerry's, chocolate chunks, frozen Greek yogurt, Greek yogurt, raspberry. Bookmark the permalink. Leave a comment.